The Ohio String Teachers Association is a state chapter of the American String Teachers Association. You are automatically a member of OSTA when you join ASTA with NSOA. Why join ASTA? Benefits include the American String Teacher Journal, access to online discussion groups, access to string employment opportunities, discounts on cutting-edge publications, state chapter membership, conferences, discount instrument insurance, and other great opportunities. You can get ASTA membership info here. The Ohio String Teachers Association is dedicated to promoting, supporting and sustaining string and orchestra education in Ohio. Jim Bates, President is Director of Orchestral Activities at Otterbein University in Columbus, OH and serves as an assistant conductor for the Columbus Symphony Youth Orchestras. As a conductor and teacher, Dr. Bates is able to draw on considerable experience as an educator, performer and historian. For eighteen years he was a conductor for the Louisville (KY) Youth Orchestras and was music director of that organization from 1996 – 2001. In 1999 he joined the conducting staff of Interlochen Center for the Arts and continues to direct the Junior Orchestra program and Junior Advanced String Institute there in the summer. In fall 2006 he began as an assistant conductor for the Columbus Symphony Youth Orchestras. He has served as a clinician or guest conductor in Ohio, Kentucky, Virginia, New York, North Dakota, South Dakota, Nebraska, Kansas, Minnesota, California, Missouri, Pennsylvania, Maryland, Washington, Alabama, Colorado, Texas, Massachusetts, Oregon and Saskatchewan, Canada. He has served as president of Kentucky ASTA and as string coordinator for the Kentucky Governor’s School for the Arts. From 2010-2012 Dr. Bates chaired the Coda Bows for America Community Outreach Program for ASTA. Currently he is president of the Ohio String Teacher’s Association. In addition to string education he is very involved with the Classical Mandolin Society of America and period instrument performance. He is on the National Board of Directors of CMSA. While living in Louisville, Dr. Bates was the director of the Louisville Mandolin Orchestra from 1988 to 2001, and under his leadership the LMO was invited to mandolin festivals in Germany, France and Spain and performed in the nationally syndicated Lonesome Pine Specials, produced by the Kentucky Center for the Arts. In Columbus currently, Dr. Bates is assistant conductor and principal bassist of the Westerville Symphony (OH), and is the creative director for The Early Interval, Columbus’ professional early music performance ensemble. His early music performance interests include the Baroque double bass, viola da gamba, Medieval vielle, and recorder. He also serves on the board of the Friends of Early Music, a presenting organization for early music in Columbus. He has degrees from the University of Louisville (B.M.E. ), a Masters in double bass performance from Indiana University, where he studied bass with Lawrence Hurst and baroque performance with Stanley Ritchie, and a Ph.D. in Musicology from the University of Kentucky. His research focus continues to be centered on issues of historic performance practice. Mark Rudoff, President-Elect Applauded by critics as “an exceptionally gifted cellist” and “a charismatic performer,” Mark Rudoff has performed in solo recitals and with orchestras in Canada and the United States, with solo and chamber performances recorded for broadcast on the CBC. Currently Strings Area Head and Associate Professor of cello and chamber music at The Ohio State University, he previously taught cello, chamber music and orchestra at Brandon University in Manitoba, Canada. Mark has also taught at The Castleman Quartet Program in residence at SUNY Fredonia, Interlochen Summer Arts Camp, Zephyr International Festival and the Florentia Consort Renaissance in the XXI Century, and has served on the juries for the Eckhardt-Gramatte, Fischoff and Plowman competitions. A respected chamber and orchestra musician, he performs with Janus, the Galileo Trio and Chiarina Piano Quartet, and has served as principal cello of the Calgary Philharmonic and Saskatoon Symphony Orchestras. In 2018, Mark was appointed Music Director and Conductor of the Cincinnati Community Orchestra, and previously directed university symphony orchestras at Ohio State and Brandon, and the Winnipeg and Saskatoon Youth Orchestras. Mark earned Bachelor’s and Master’s of Music degrees from The Juilliard School, studying under Lynn Harrell, Harvey Shapiro, Joel Krosnick and Lorne Munroe, and graduating with the Edward Steuermann Prize. Mark also holds a Bachelor of Laws degree from the University of Saskatchewan, where he was appointed to the editorial board of the Saskatchewan Law Review and graduated with distinction in 1990. Gayley Hautzenroeder, Secretary is from Long Beach, California, a cellist, and a graduate from the University of Cincinnati College-Conservatory of Music, with a M.Ed. from Xavier University. She is retired from the Forest Hills and Northwest School Districts as an Orchestra Director and String Specialist for 35 years. She has also taught Music Education courses at Xavier and Miami Universities. She has been active for many years in O.O.S.T.A. and O.M.E.A. She has served O.M.E.A. in various offices. She is currently serving as the O.M.E.A. State Instrumental Advisor for Adjudicated Events and was recently the Coordinator of OMEA’s All-State Groups for the 2011 Professional Conference. In addition, she serves as an adjudicator, clinician, and guest conductor. Mrs. Hautzenroeder plays in the West Chester Symphony and volunteers in several capacities for the Cincinnati Symphony Orchestra, while teaching privately. She has co-authored the new supplemental string text, Developing Virtuosity, with Lynne Latham and Thom Sharp. Among her honors and recognitions, Gayley was the recipient of the 2004 OSTA Public School String Teacher Award, Ohio’s Best Practices Award in 1999 (for interdisciplinary teaching and curriculum), and the 2006 University of Cincinnati Outstanding Teacher USA Award. James Ledbetter, Treasurer James Ledbetter holds both a Bachelor and Masters Degree in Music Education from Wright State University, with emphasis in Double Bass and Classical Guitar. His principal teachers include: Donald Compton, Mark Morton, Jim McCutcheon and Douglas Neidt. A Conducting Fellow at the University of South Carolina, Mr. Ledbetter studied with Paul Vermel, Donald Portnoy, Peter Jaffe, and Victoria Bond. He is a former conductor of the Springfield Youth Symphony, Great Miami Youth Symphony and is currently director of the Northern Kentucky Youth Symphony Orchestra. A double bassist, his performance credits include: The Springfield Symphony, Middletown Symphony, Hamilton Fairfield Symphony, Wright State University Chamber and Community Orchestras as well as the Wright State University Department of Theatre and Motion Pictures. As a teacher Mr. Ledbetter has served as orchestra director for the Kettering City Schools, Hamilton City Schools and the Forest Hills City Schools. Additionally, Mr. Ledbetter is the director of music for the Lindenwald Baptist Church in Fairfield, Ohio. In February 2014, he had the honor of conducting the Hamilton Fairfield Symphony Orchestra on their American Masters Concert with composer Mark Dal Porto in attendance. A favorite memory is the opportunity to play in rehearsal for Stephen Schwartz as his new production Snapshots was produced. Erin Yelton Broadhurst, is an Orchestra Teacher for the Hilliard City School District, where she works with students in grades 6th-12th and maintains a private viola studio. Her prior performance experience includes membership in the Springfield Symphony, the Newark-Granville Symphony, and Sorg Opera Orchestra. Erin began her musical training with viola study in the Cincinnati area, earning a Bachelor of Music Education degree at Baldwin-Wallace College, then completing Masters degrees in both String Pedagogy and Viola Performance from the Ohio State University. Her previous teaching background includes serving as the director of the Middletown Youth Symphony, teaching 4th-12th grade orchestra in the Middletown City Schools, and serving as a section coach for several of the Columbus Symphony Youth Orchestras. In 2003 she was chosen as the Ohio String Teachers Association’s Young Teacher of the Year, and was designed a Master Teacher by the Ohio Department of Education. In 2016, Erin was a recipient of the Baldwin-Wallace Outstanding Educator Award. Patrick Barrett, Board Member Patrick Barrett is the orchestra director at Hilliard Davidson High School. His responsibilities include conducting the four orchestras at Davidson High School and assisting at Weaver Middle School and Tharp Sixth Grade School. Mr. Barrett previously taught orchestra in the Perrysburg School District for five years, where his junior high ensemble performed at the OMEA Professional Development Conference in Cleveland in 2015. He was also a conductor of the Toledo Symphony Youth Orchestra from 2015-2018, where he music directed the Symphonic Orchestra and Concert Strings. Concert Strings performed at the OMEA Professional Development Conference in Columbus in 2018. Mr. Barrett has served as guest conductor and clinician for the OMEA District 14 Junior High Honors Orchestra, the All-County Middle School Orchestra Festival in Louisville, Kentucky, and the University of Toledo Symphony Orchestra. He has held the position of music director of the Perrysburg Symphony Orchestra for the 2017-2018 season. Mr. Barrett is a graduate of The Ohio State University with degrees in music education and flute performance. Dr. Penny Thompson Kruse, Board Member. 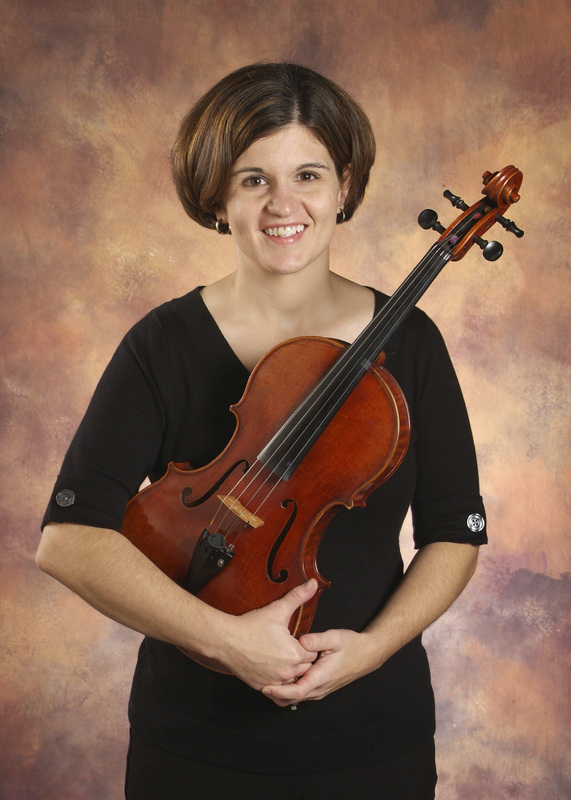 Dr. Penny Thompson Kruse, professor of violin at Bowling Green State University College of Musical Arts, is active as a teacher and a performer. Prior to her BGSU appointment, Kruse was on the faculty at William Jewell College in Liberty, Missouri, and was a member of the Kansas City Symphony. Kruse has performed and presented at state, national, and international conferences, including College Music Society, International Viola Congresses, Percussive Arts International Conference, the Primrose International Festival and the American String Teachers Association Conferences. Trained at Northwestern and Yale Universities and earning a D.M.A. in violin performance from the University of Missouri—Kansas City, Conservatory of Music and Dance, Kruse has co-authored articles in American String Teacher, the Strad and Journal of the American Viola Society with her husband, Steven Kruse. Penny teaches at the BGSU String Camp Summer Music Institute, maintains a private studio and will join the faculty at the Bay View (MI) Chamber Music Festival in June 2015. Committed to improving string playing in Ohio, Penny is an OMEA Adjudicator, an ASTACap Adjudicator and recently has made video tutorials available on her YouTube channel, teaching the violin audition repertoire for several OMEA Regional Orchestras. JulianRoss is Professor of Violin and String Department Chair at Baldwin Wallace University and violinist of BW’s Elysian Trio and Lyceum2. An uncommonly versatile artist, Ross has appeared as soloist with orchestras and wind ensembles in a broad spectrum of repertoire, ranging from standard Baroque and Romantic concerti to world premieres of new works that he has commissioned. His professional orchestral posts have included concertmaster of the Tallahassee Symphony and the New Hampshire Symphony. As chamber musician, he has toured in the U.S. and abroad as founding member of the Arcadia Trio and with the Boston Musical Arts Consortium, the Music from Yellow Barn Tours and the Memphis Piano Quartet. Ross participated in the Yellow Barn Festival for 11 years, and was on the summer faculties of Brevard, Aria International Summer Academy, Tennessee Governor’s School and the Blue Mountain Festival. He has been honored to perform many works under their composers’ supervision, including music by Don Freund, Stefan Freund, William Bolcom, John Cage, Chen Yi, John Harbison, Krzysztof Penderecki, Alfred Schnittke, and Charles Wuorinen. Ross’s own original compositions have been received warmly by audiences and are being performed with increasing frequency. Before coming to BW, Ross served on the faculties of Memphis State University and Florida State University. A devoted teacher, he recently composed a set of etudes addressing tenacious violinistic problems and is currently developing a melodically reinforced approach to scale studies.Ross’s students have won competitions, earned leadership positions in professional orchestras, established themselves on teaching faculties and continued studies at major music schools. He is a past President of the Tennessee String Teachers’ Association. Ross earned degrees from Rutgers University, Eastman School of Music and the Cincinnati College Conservatory. His major teachers included Arnold Steinhardt, Sylvia Rosenberg, Eric Rosenblith, and Jens Ellermann. Dr. Juliet White-Smith, Board Member. Violist Juliet White-Smith is an active international soloist, chamber musician and clinician. She has been a guest artist at Strings in the Mountains and the Fontana Festival in Michigan. She has performed in the viola sections of the Rochester Philharmonic, the Houston Grand Opera Orchestra, and the Grand Rapids Symphony. White-Smith is in demand as a master class teacher, clinician and adjudicator. She has presented master classes at Mahidol University College of Music in Thailand, the Eastman School of Music and for the annual conference of the American String Teachers Association. She was the featured pedagogue in “Ask the Teacher” in the April 2010 issue of The Strad magazine. She has been a string juror for the William Primrose International Viola Competition, the annual concerto competition of the Texas Association of Symphony Orchestras and the Fort Collins Symphony Orchestra Young Artists Concerto Competition. A prominent advocate of the viola, White-Smith served as president of the American Viola Society 2008-2011. Her debut CD recording of works by contemporary American composers George Walker, Michael Colgrass and Maurice Gardner (Fashionably Late: Juliet White-Smith Debuts!) was released in May 2009 on the Centaur Records label. White-Smith earned the doctor of musical arts degree at the Eastman School of Music. Prior to her appointment at the University of Northern Colorado, she was a visiting professor at Western Michigan University. Gretchen Zunic, Past President/Board Member teaches orchestra students in grades 4-12 in the Upper Arlington School District. She has a BM from B.G.S.U. and an MA from the Ohio State University. She has worked as a director at both the O.S.T.A. Middle School and B.G.S.U. String Camps. She has served as Mini-Conference Chair, Middle School Orchestra Festival Co-Chair and Journal Editor for O.S.T.A. She is also currently an active adjudicator for O.M.E.A. Trista Emmons, Past President is a graduate of the Cincinnati College-Conservatory of Music (BM, Viola Performance), the Cleveland Institute of Music (MM, Viola Performance), and Case Western Reserve University (MA, Music Education). She is the Director of Orchestra for the Indian Hill Schools in Cincinnati, Ohio. She is an active private studio teacher, OMEA adjudicator, Chair of OMEA District 14 Honor Orchestra, and OMEA Conference Orchestra Content Chair .